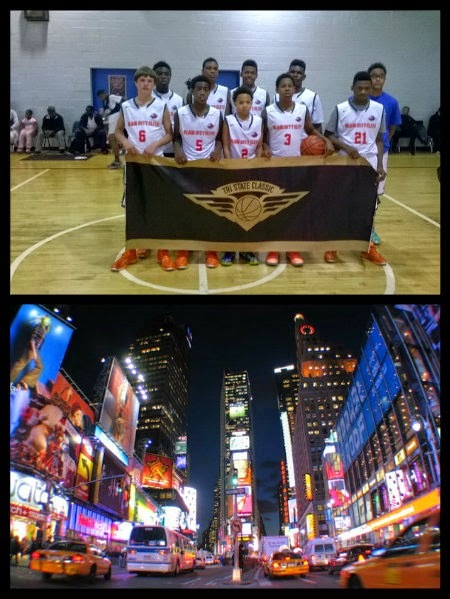 BASKETBALL SPOTLIGHT NEWS: Weekend Recap: "The Terror Squad" Invades The Big Apple! Weekend Recap: "The Terror Squad" Invades The Big Apple! 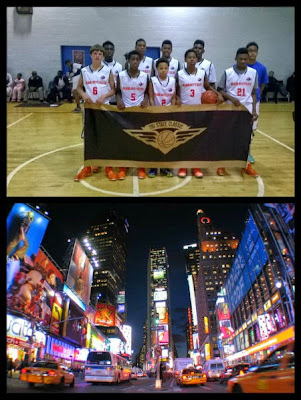 Slam City Elite traveled to the Big Apple to lace their shoes up for the first time in a real game this season. The Tri State Classic League is a well known NYC Summer League where many pros and college players compete in the NYC street ball atmosphere where there is music blasting, a “HYPE” man is on the mic, ruckus crowds fill the stands, and celebrity coaches like Fat Joe enter their team in hopes to earn bragging rights by winning the chip. Tri State Classic organizer Mousey brought the same concept to the Middle School AAU teams and organized a Back to School League. Slam City Elite (Pre-season #1) was invited and accepted. They were pitted against the Top 4 teams in NYC over Saturday and Sunday in the same environment you see at Rucker Park but rather inside where the whole atmosphere was a lot louder than on the NYC Playground courts. The game of the weekend turned out to be an Instant Classic. This game turned out to be the game of the weekend as many expected. This was the Terror Squad’s first of two games on Sunday. The Gauchos is one of the most storied AAU programs in the country and coming off a #5 AAU Nationals finish was a perfect test for The Terror Squad to see if they are truly one of the favorites to win it all this year. The Gauchos had a big time home court advantage but in the end Slam City Elite was victorious winning 79-72 in a game they controlled the whole time being up by as many as 12 points in the first half and 9 points in the second half. Terrance Williams had a career game scoring 38 points and grabbing 21 rebounds. Jordan Toles added 14 points and 9 boards and Tyler Brelsford had 10 points and 8 assists. Isaiah Todd chipped in with 11 rebounds. New Heights who has become a top Under Armour program in the country was The Terror Squad’s first game on Saturday. Being their first game of the season they were amped up to play and came out rolling. Tyler Brelsford hit three 3pointers in the first half one being at the buzzer taking a 13 point lead into halftime and they never looked back winning 66-47. Terrance Williams had 20 points and 7 rebounds. Jordan Toles finished with a double-double 12 points and 13 rebounds. Tyler Brelsford tallied 11 points and 5 assists. Isaiah Todd contributed 9 rebounds and Cameron Byers and Ryan Conway each had 7 points apiece. Having to play back to back, the second game on Saturday was a potential trap game for The Terror Squad as it took them all 32 minutes to pull out a 51-50 victory. PSA controlled most of the game after they took the lead late in the first half. Ryan Conway was the hero as he hit a trey ball down 2 to put Slam City Elite up by one with under a minute to go. Slam City had a bad shooting day from the field but was able to fight through adversity which championship teams will need to face throughout their season if they want to have any chance to win the NYBL and AAU National Championship. Terrance Williams had another stellar performance tallying 21 points and 18 rebounds. Jordan Toles had 7 points that included two electrifying dunks. Ryan Conway chipped in with 6 points. This was the last game on Sunday and after an emotional win over the Gauchos The Terror Squad wanted to go 4-0 and head down I-95 to get ready for next weekend’s Hoop Group Fall Jam Fest. They did just that winning 50-34. Isaiah Todd led the way with a double-double 10 points and 11 rebounds. Cameron Byers added 10 points and 6 boards. Terrance Williams netted 10 points.